Driving through Holgu?n province recently, I passed an antediluvian automotive abuelo, dead as a dinosaur, stopped in the middle of the road in the middle of nowhere. Time itself seemed to have stopped on the carretera midway between Bayamo and Veguitas. The curvaceous Chevy Bel-Air stared me down with its acres of bechromed grinning grillwork. Its hood was propped open while two men peered into the engine. A third lay half-hidden beneath the car. They were still there, frozen like museum pieces, when I zoomed by in the other direction three hours later. Broken-down cars from the 1950s are part of the Cuban reality, adding another mantle to the multi-textured layers of a temps perdu. Classic pre-revolutionary autos number about one in every eight-passenger vehicle in Cuba. Only a very rare handful are shining examples of museum quality. The majority are barely able to hang on to their homemade parts as they clatter down the highways on worn-to-the-fabric, under-inflated tires, their decades-old joints creaking and rattling rheumatically. The tough reality of caring for vintage cars in the modern age of embargo and shortage poses challenges we can?t even think of. Forget spare parts dealers, classified advertising, or Yellow Pages. They don?t exist. There hasn?t been an American car parts distributor in Cuba for decades. Nor are there Internet web-sites to help frustrated owners locate that desperately needed crank pin for a 1957 Mercury Turnpike Cruiser. The island operates like a giant swap meet, with antiquated parts traded by word of mouth. Abandoned vehicles are picked clean until only the skeletons remain. Most cars are a medley of oddball parts stitched together, like Frankenstein?s monster. Czech carburetors. Polish pistons. And other parts cannibalized off cars from the Soviet bloc. Need a new piston for your early fifties Chrysler? The pistons of a Soviet GAZ-51 truck will do just fine, as their engines were cloned from a Detroit engine. Many jalopies have long since been fitted with tractor or other diesel engines.
? ?No fue f?cil!? Alcides Pardo told me, explaining how he managed to Houdini a tractor engine under the hood of his 1956 Chrysler Imperial. It wasn?t easy! Cubans are geniuses of eclectic invention. The most impossible conjugations will leave you amazed. ?El cubano inventa, chico,? Frank Enrique added. The grime-stained mechanic was hunched inside the wheel well of a 1952 sky-blue Buick Riviera, haloed by a shower of sparks. His wife sat nearby, snipping out an engine gasket from the base of a rubberized bath mat with a pair of worn scissors. Pieces from the disassembled engine were arranged on a rug in the yard, which was crammed with engine blocks, shock absorbers, dented gas tanks, exhaust systems, and other scrap metal items waiting to be modified into homemade auto parts. ?What we can?t fix or cannibalize from other cars we make ourselves. We tailor pistons and virtually any other part you can think of right here. Hecho en Cuba, chico!? Cuban car owners even concoct their own hydraulic fluids from shampoo, washing-up liquid, and left-over cooking oil mixed in a blender. As for tow trucks or AAA, forget it. When your car breaks down, you?re on your own. Repairs are performed alfresco, in the street or wherever a car happens to fizzle and die. You get under the hood and find a way to cobble a solution from whatever the situation allows. If all else fails, Cubans invoke the help of Eleggu?, the Yoruban orisha, or god, of destiny and the guardian of roads in the Cuban Santer?a religion. Chrome is a particular problem. The Caribbean salt air plays havoc on the acres of oozing brightwork, much of which rusted away years ago to be replaced by ?Arkansas chrome? (silver paint). Ask Eugenio O?Hallarans, a spry 77-year-old with a soft, friendly face. His workshop in the colonial-era village of Santiago de las Vegas, about 15 miles southwest of Havana, draws a steady stream of clients seeking embellecedores de lat?n (literally ?tin embellishments?) to replace rusting trim. Freelance chapistas like O?Hallarans lack electrolytic components to produce chromium plating. Using equipment that pre-dates the Revolution or is of Soviet progeny, O?Hallarans cuts and crafts wheel trims, fender flares, body side moldings, etc. from sheets of raw tin. Other cuenta-propistas (self-employed craftsmen) earn their living restoring upholstery, using ingenuity and whatever fabric comes to hand. Many a car?s ruined interior is hidden beneath cleverly redone upholstery, often hardly discernible from the original fabric, though more often betraying its origin, perhaps as a shiny oily-black tablecloth. As for tires?new tires—American made, embargo or no embargo—are available at Servi-Cupet gas stations but cost about $100 each and are thereby a luxury item that few can afford. Many Cubans have resorted to stuffing grass in their threadbare tires to keep them rolling. 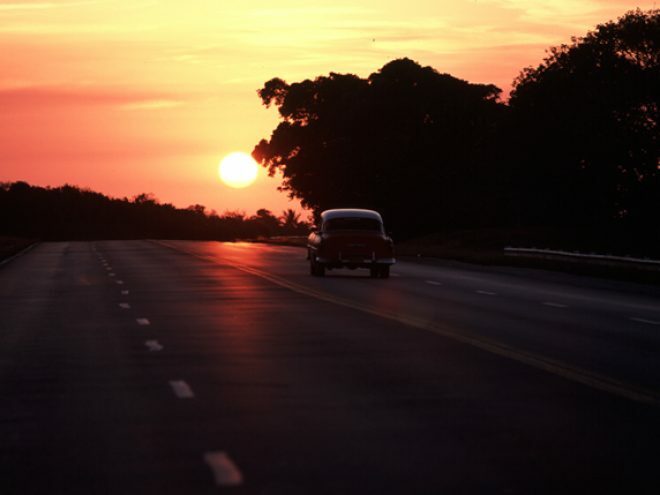 Every Cuban dreams of owning a car, though the chances are slim. All cars imported since the Revolution, including in recent years a miscellany of modern Japanese and German models, are essentially company cars for which generally only senior management or benighted sports stars and musicians are eligible for. Owners of pre-1961 cars, however, can sell them freely to anyone with the money to buy. The cost is usually exorbitantly high. Hence, Cubans have no choice but to keep their weary cacharros running with resourcefulness, ingenuity, and indefatigable good humour. Their enduring spirit, passion and dedication to the care of their classic cars inspire us all. Christopher P. Baker is a professional travel writer and photographer, and leads tours of Cuba for MotoDiscovery and National Geographic Expeditions. His six books about Cuba include MI MOTO FIDEL: MOTORCYCLING THROUGH CASTRO?S CUBA (National Geographic Adventure Press), winner of two national book awards. In 1996 Christopher shipped his BMW R100GS motorcycle to Cuba and rode 7,000 miles during a three-month journey to research the Moon handbook to Cuba. His award-winning literary travel book – Mi Moto Fidel: Motorcycling through Castro’s Cuba – describing the journey was published by National Geographic Adventure Press.